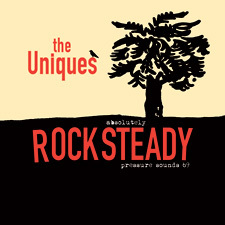 Coming soon from Pressure Sounds is a CD/Vinyl LP compilation of Bunny Lee produced sides from perhaps the greatest rocksteady vocal group of them all, the Uniques. Some dozen years ago Pressure Sounds released a Uniques compilation called Watch This Sound. This new collection treads similar ground but with significant changes to the track listing. Given that the old compilation is now deleted they’d have been forgiven if they’d stuck it out again with very few changes anyway, but a fresh look at this material is more than welcome. The Vinyl version will come with a screen printed cover which sounds very cool.